Each year at ADGA Annual Convention, a Youth Representative and Alternate Youth Representative are chosen to represent ADGA Youth for the following year. To be considered, you must apply. There are also several opportunities for travel and writing you will need to make commitments to if you apply. a. Write quarterly articles for the Youth News section of ADGA News & Events in coordination with the ADGA Communication Specialist. b. 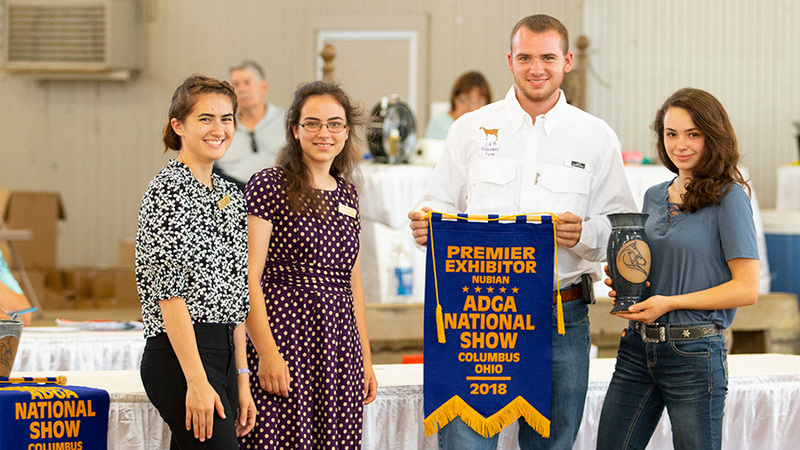 Assist the youth leaders during National Show, present awards during breed shows and the final Award Ceremony. c. Make a 5 minute PowerPoint presentation of the year’s activities at the Youth Banquet at Annual Convention. d. Coordinate and implement welcome activities for the Annual Meeting Youth Program. e. Give a 30-45 minute educational presentation at the Annual Meeting Youth Program. 1. Submit a completed application to the ADGA Youth Annual Meeting Committee Chair before 8:00 pm on the first full day of the Annual Meeting Youth program. 2. Attend and participate in the Annual Meeting Youth Program. 3. Participate in an individual interview with the Youth Representative Selection Panel. 4. Present a 2-4 minute speech at the ADGA Youth Banquet over a topic assigned to you on the afternoon of the youth banquet. 5. Answer one impromptu question from the Youth Representative Selection Panel after giving your speech at the Youth Banquet.